From the highest fertile grounds of the Sierra Nevada Mountains near Lake Tahoe, California comes one of America's most prized collections of high-quality close-up magic. 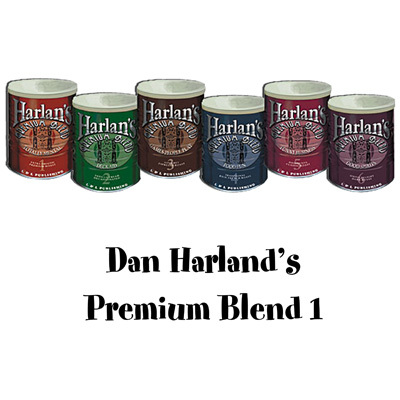 Dan Harlan's Premium Blend performances have been hand-selected from only the finest routines in his vast field of expertise. Whether you crave the luscious simplicity of powerful presentations or the deep dark smoothness of authentic sleight-of-hand, you're sure to find a flavor you cannot live without. PHOTO FINISH -- A bunch of photos cut into quarters are mixed and four pieces randomly chosen. These pieces form a complete picture. NATURAL SELECTION -- The magician controls the spectator's will to select the odd card among a group. MAGIC SPELL -- Alphabet cards are mixed and five are chosen, but the word MAGIC comes up each time it is tried. HARLAN HOOKUP -- The magician makes a spoon move with his mind, then demonstrates that he is creating an energy field between his hands which can easily be felt by anyone. UNDER COVERS -- Writing appears inside a previously empty matchbook. DESTINATION UNKNOWN -- Coins from various countries are hidden under cards and a small toy airplane is placed onto the card a spectator chooses. The cards are turned over and letters upon each spell out the country which matches the coin chosen. MIXED EMOTIONS -- Poker chips bearing icons of emotion are stacked by a spectator and the magician predicts which emotions will be chosen. BOTH SIDES AGAINST THE MIDDLE -- A spectator shuffles a deck under the table and reverses one card, placing it back in anywhere. The magician has predicted the reversed card and the card next to it. CRYPTIC COOKIE -- A fortune is read which appears to have nothing to do with a selected card, but when folded it reveals the name of the selection.